Rabie Property Group and the Century City Property Owners’ Association (the non-profit company responsible for the day to day running of Century City) have created an Arts Foundation to foster both visual and performance art in the precinct. Formed five years ago, the main thrust of the Foundation’s work to date has been to establish an Arts Trail at Century City and there are currently 25 exhibits throughout the precinct. The most recent addition has been a Janko de Beer bronze sculpture of a horse’s head. The stunning statue, entitled Sanctified, forms part of Janko’s Equus horse theme series which is based on the mythical relationship between humans and horses. 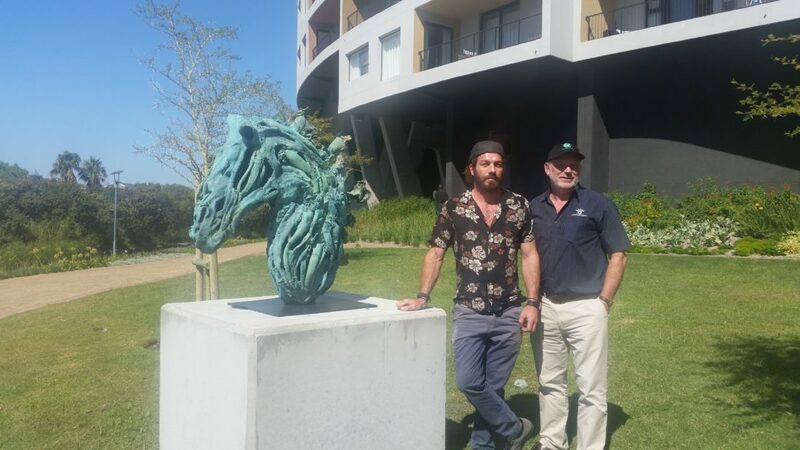 The third in an edition of eight variable bronzes, Sanctified weighs around 130kg and has been erected on a concrete plinth near the Waters Edge development overlooking the canal and Intaka Island. Sanctified was donated by the artist to the Century City Arts Foundation which only had to pay for the casting. Other bronzes in the edition have retailed for around R450 000 with the value expected to continue increasing over time. There are also a number of scientific and technological exhibits. Some of these exhibits have been commissioned by various corporate citizens of Century City and executed by community-based and other artists. The only inside works of art at this stage are four exhibits including two sculptures in Canal Walk and the Century City Conference Centre Art Collection, an exciting array of Afro-centric art pieces from sculptures to photographic works and vibrant oil paintings which are united around a loose theme of people and communication. Certain of the pieces were acquired at charity auctions and the entire collection was donated by the developer of Century City, the Rabie Property Group. The art trail is open to the public free of charge. Rabie director John Chapman who chairs the Foundation said the Rabie Group had a strong commitment to giving back to the community. This was evidenced in both the work and resources it has ploughed into Sinenjongo High School in Joe Slovo Park (an RDP housing estate and informal settlement down the road from Century City) in the past decade as well as its commitment to the Intaka Island Eco Centre in the heart of Century City which runs an outreach environment education programme. Chapman said while still in an embryonic stage, the Arts Foundation had achieved some milestones with its support not only limited to the visual arts. “Over the past couple of years, the Arts Foundation has organised and run Art on the Island, which comprises a variety of exhibitions and creative kiddie activities, as a complementary attraction to the Century City Natural Goods Market which is held during the summer months. These Community Art events have ranged from Fine Art, to African Art and Curro Century City school art exhibitions, to pottery and music workshops, Easter egg painting, to puppet shows to mention just a few. Chapman added that additional exhibits and partnerships were being sought so that they could continually add to Century City Arts Trail, keeping it alive and fresh to encourage members of the public return again and again to enjoy the exhibits. The independent Foundation has Public Benefit Organisation status enabling it to issue Section 18a Certificates to donors.